Like many people, when I first heard that was in the works, I was more than a bit apprehensive about it. The first teaser trailer, full of one-liners as it was, gave me the impression that the only decent two minutes of the film had just been viewed. I was still going to see it, but I was not expecting much more out of the movie than to bore my wife with an earful of complaints after the credits rolled. I forget the exact moment when, watching a newer trailer about a month ago, something changed. It was a profound moment (that I just can’t happen to remember), but I actually wanted to see the movie! I prepped myself well, with steady viewings of new trailers and TV spots, getting my two-and-a-half year old son excited to see his first movie in a theater, and inadvertently getting hooked on “Everything Is AWESOME!! !” (which led to me buying the entire soundtrack). Come February 7th, I was SO PUMPED UP! I saw The LEGO® Movie opening night with my wife and a group of friends and it’s safe to say we all loved it. We then took my son to see it two days later and were surprised that he sat rapt for the entire movie. The first word out of his mouth when the credits rolled was “MORE!” A true LEGO fan in the making! The second viewing was just as good, if not better, than the first. Much ink has been spilled on the subject. Most reviewers of the movie have a cursory knowledge of what “Legos” are and spout the same facts over and over with some quips about how everything in the movie “fits together.” I don’t fault them for that; they have little invested in LEGO other than getting people to read their reviews for the next few weeks. Their analyses of the movie are fair enough, and I defer to them in that regard. I hope to offer a different take on the movie, not a formal critique per se, but just the perspective of a guy who really likes LEGO. Onto the movie! Oh, The LEGO® Movie… sure, we didn’t meet on the best of terms, but that’s all history. We’re cool now. The movie is a critical and commercial success, as well it should be. It’s a GOOD movie. It’s a FUNNY movie. It’s an INSPIRING movie. Allow me to expound on those three points. The LEGO® Movie is good fun. The story is a bit formulaic (to a point), but I see that as a strength in two ways. First, one can relax and just enjoy the comedic and visual elements of the movie. Second, the story is later revealed to be the product of Finn’s imagination. I don’t know many eight-and-a-half year olds with enough story writing acumen to turn Hollywood on its back, so the fast-paced, slightly choppy, cookie-cutter story, at least to the point of Emmet’s transportation into the real world, is more than fitting. The turn the movie takes from there was a welcome surprise, and puts it on a much deeper plane that anyone with a heart can relate to. With the inclusion of the live action sequence, I think the film outshines most animated features almost to the extent Toy Story did in 1995. 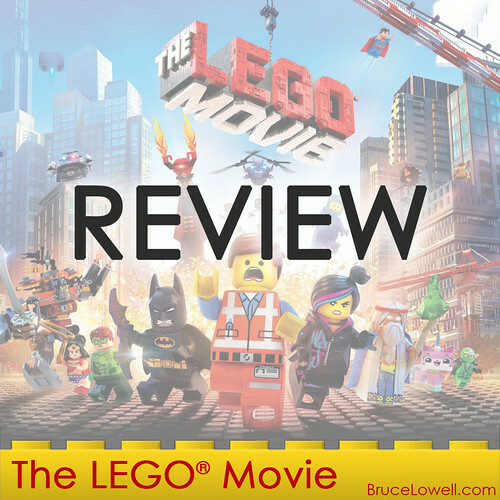 The LEGO® Movie is funny; it’s literally packed with jokes, even in its most serious parts! I must confess both times I saw it I was the only one who laughed out loud when Vitruvius, right after almost giving Emmet the key to defeating Lord Business, saying, “What I’m about to tell you will change the course of history…” abruptly dies with a gasp as X’s cover his eyes. His reappearance as a ghost on a string is even funnier. “Emmet, you didn’t let me finish earlier… because I died.” The micro-scale scenes with mouthed sound effects are inspired. Will Arnett is competing with Christian Bale for my current favorite incarnation of Batman, though for very different reasons! Be sure to check out his song, “Untitled Self-Portrait.” The line “NO PARENTS!” had me laughing for about five minutes straight. The LEGO® Movie is inspiring. The entire world, including crashing waves, lasers, explosions, steam, and everything in between is made of LEGO bricks. I like the subtle inclusion of a fingerprint on Emmet’s torso, which can only be seen when his reflective stripes hit light at the right angle. I can relate to how Wyldstyle sees the world around her when creating her super cool Super Cycle. The nods to the AFOL (Adult Fan of LEGO) community are numerous, and show the care that the filmmakers took in producing this. I left the theater inspired to go home and BUILD! I think seeing some of my MOCs in the movie and credits served as a fresh reminder that people actually like what I build, so that might have contributed to my elation. Will Ferrell’s character says that LEGO is not a toy, but “a highly sophisticated, interlocking brick system.” I know some AFOLs who forget that, at the end of the day, we’re all just playing with toys. So we might as well have fun with it, right? I know from personal experience how getting too “deep” into the hobby and letting it take preeminence over other things can lead to a burnout. I’d like to think I’ve found a good balance in the past few years in appropriately focusing my energies. LEGO® bricks are still the principal means through which I channel my creativity, but I’ve also enjoyed the peripherals that surround building; taking and editing photos, being involved in a local group and visiting conventions, taking commissioned work and other related events (including being in movies! ), and most importantly building with my son. Seeing as the LEGO® Company’s name derives from the Danish phrase “leg godt” (play well), I’ve seen a boost in creativity and playfulness as a direct result of The LEGO® Movie; with my son and his friends, but also in the AFOL community and with myself. If a silly 100-minute “kids” movie can do that, I’m all for it.